The following document will cover creating printing presets, printing using created presets, and setting a preset as the default preset. 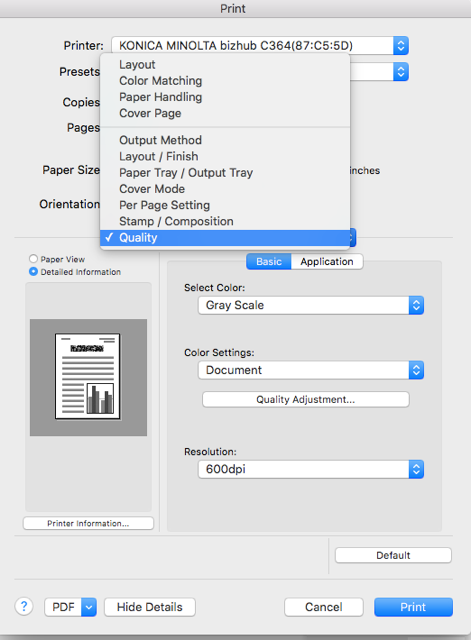 Note: The following provides instructions for printing using the standard features in OS X and may not match your setup. If these instructions differ from the user interface you’re seeing, refer to the documentation that came with the app you’re using. To see more options, click Show Details. 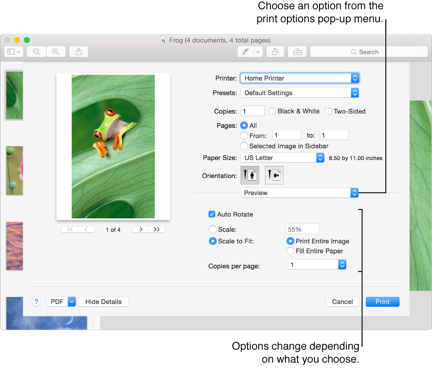 Depending on the app you’re using you may see options for changing the paper size for a document, setting the default paper size, and more. You can save your print settings as a preset so you can quickly use the same settings again. To create a preset, you first adjust all of the print settings you want. Open a document, then choose File > Print. Click Show Details. you want to save as a preset. Click the Presets pop-up menu, then choose Save Current Settings as Preset. Enter a name for the preset settings, then choose whether to use the preset for only the currently selected printer or all printers. Click the Presets pop-up menu, then choose your preset. If you don’t see the Presets pop-up menu, click Show Details. Hold the Option (alt) key when choosing or printing your preset, and it will become Default.